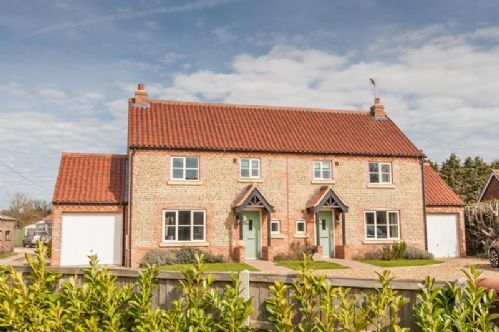 This modern, comfortable and very dog friendly cottage is one of a pair purpose built for holiday letting in the friendly village of Trunch. With its easy, open plan living space, underfloor heating and slate floor plus the very secure garden, it is a very popular choice with multiple dog owners particularly as it is a short walk to the dog friendly local pub and a few minutes' drive to many of the local, sandy and dog friendly beaches. The surrounding countryside provides plenty of easy walking routes and there is a lot to see and visit in the area generally. The owners are real dog lovers and are happy for any number of dogs to holiday here. Farthing cottage is spacious and comfortable with everything you need provided, plenty of games and books and even a dart board in the garage for those wet days. The rear garden is very secure so if you are bringing dogs it's no problem. The local pub is only a short walk away and has recently become a community run business very friendly and nice food but limited choice at the moment. We did have an issue with the heating / hot water as the boiler had lost pressure, this took a day and a half to get sorted as no one at East Ruston Cottages was responding to our calls or texts, when they finally did they called Louise the cleaner who came round with her husband Shane and they sorted it all out, they were very friendly and contacted the owner of the cottage who was upset that our much needed break had been spoilt. Despite this we would stay there again and recommend it to others. We have yet to hear from East Ruston Cottages. The location is ideal for walks in the local area or following a 5 min drive to Mundsley beach, a large expanse of beach. If you wish to venture further afield,then the coast to the North and South have lovely walks and dog friendly beaches. Many also have dog friendly cafes for a hot drink and food. The accommodation was an ideal size for 2 adults and 2 St Bernards, with a nice size garden for them to use. The village has a local shop and Pub both of which are a very short walk from the cottage. The Pub is dog friendly and offers food most days/evenings, they also offer various takeaway Pizzas, freshly made, we highly recommend especially on your first night saves cooking. The area offers a vast myriad of entertainment options covering every taste. We liked the village that much we are now looking at retiring there in the next 12 months. The cottage is very clean and comfortable and is supplied with everything you need. The underfloor heating and the log fire made it very snug in winter when we have stayed there.The garden is completely enclosed with a decent high fence so is dog proof. There are many walks from the front door across beautiful countryside,maps are provided. The village is very quiet and pretty but only 10 minutes from a larger town with all the amenities. It is also a short drive from many lovely beaches. East Ruston Cottages are not just dog friendly,they positively encourage you to bring your dogs and supply everything you need. Can't recommend them highly enough. We had a lovely week's holiday over Christmas at Farthing Cottage in Trunch, Norfolk. This was our second visit to the cottage but it was our first visit to Norfolk in the winter. The cottage was perfect, very clean and welcoming and was very tastefully decorated for Christmas. There were even lots of presents from the cottage owners and the cottage company for our 2 Boxer dogs, a very nice gesture and much appreciated! There was also a nice bottle of Prosecco and a cake for us! There are good dog walks around the village of Trunch and brilliant beach walks not too far away. Trunch has a good local shop and a nice pub which is also dog-friendly. This was a perfect getaway over the Christmas period and we have no hesitation in recommending it. We had a fantastic weeks break in Farthing Cottage with 6 well behaved small dogs. When we arrived there was a welcoming bottle of prosecco chilling in the fridge which was enjoyed with our evening meal. There are many good pubs nearby which welcome dogs and have a good selection of ales. I can recommend Farthing Cottage and whoever stays there I'm sure will enjoy all the home comforts it has to offer . Loved what we saw of Norfolk. Unfortunately we had awful weather and came home early. It was difficult to find places to shelter from the rain when out and about with two big dogs. The weather was dry at times and we explored some of the coast - I particularly liked Overstrand. The cottage was very cosy and warm, clean and well equipped. bigger dog beds - we have two large greyhounds and what was provided wasn't really adequate especially as the sofas are quite small. We were a bit squashed on the two sofas! Farthing cottage is a really dog friendly place to stay. Totally secure garden. Cottage so clean and tidy. Great off road walk a short way from the doorstep and beaches a short drive away. Everything you could possibly need was provided. A beautiful very dog friendly cottage. Everything provided for dogs and humans. The garden is perfect as the only access is through the cottage so no chance of escapees! super location: quiet village, shop a few feet away, circular walk on doorstep, off set from road, quiet at night, close to many places to visit,everyone we met friendly and welcoming. house: comfortable sofas, very comfy beds, well equipped, lovely garden, garage great for storing bikes, great extras like: dog beds, dog toys, dart board, DVD, ps2, BBQ, crabbing equipment. improvements could include: more powerful shower (though Norfolk water pressure not great I know) Bath a bit damaged inside, sharper cooking knives, better placed mirror in bedroom for hair drying. Cleaners arrived as we were leaving. A lovely warm and welcoming couple.